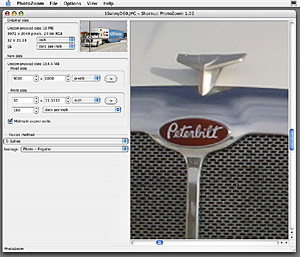 Shortcut's: PhotoZoom 1.02 interface running on Mac OS X Panther. There are limits to everything and there are times that you should not interpolate. Why upsize just because you can do it? Reed Hoffmann from Blue Pixel in his column of December 2003 touched on this subject ( www.sportsshooter.com/news/1081 ) and he is 100% correct. Mr Hoffmann said, "The only time a photo should be resampled is when it's known what size it will run (in a paper or magazine, or on your inkjet printer)." This is true and Reed is right. 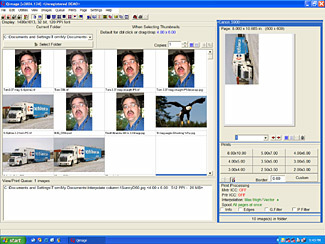 We had a day last year when a student blew up a 3.5 megabyte image to 35 megabyte and put the picture into the system and it ended up on the front page. It looked kind of funny so I checked out the image and was surprised to find a photo that was so big in our photo browser. Depending on the size we need only around 8 to 12 meg for a front-page picture. I asked why? Turns out because I had said, "As a general rule you can interpolate pictures up to 10 times their original size without losing noticeable quality", he was blowing his images up 10 times "to make them better." Of course, there is a big problem with this. When you interpolate images, you are pushing the pixels to their max and risking quality loss. Why interpolate something up way bigger than you need for final output? Best advice is to know or have a close estimate of how big the final output and resolution will be before you start interpolating to gigantic sizes! 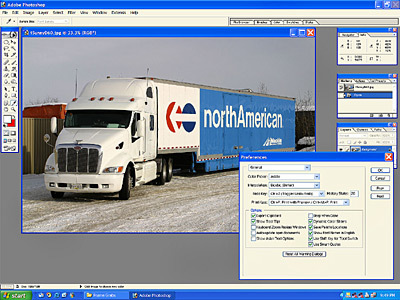 Digital Domain's: Qimage interface running on Windows XP. Another thing to consider and most photographers do not know this, but when a picture is downsized, it is also being interpolated, but just down in size. A whole bunch of digital information is being thrown away to get it down to that smaller size. This of course under certain circumstances can lead to a picture that has bad final output quality as well. It is less noticeable for sure, but it can happen. The past year alone has seen several brand new interpolating programs hit the streets as well as some of the older interpolating programs coming out with improved versions. There is now a healthy competition in this area and interpolating is becoming more and more a part of a regular workflow for many photographers, photo departments, photo agencies and production houses around the world. Interpolating is something all digital photographers need to learn about. I truly believe this is very important, and with the free trials that are available it is easy to test out. The fact is your digital pictures are being interpolated whether you realize it or not. Printer drivers have interpolation software as part of their function; how do you think it prints out at such high resolution from small digital files? The drivers and RIPpers for those big photo lab printers have some kind of interpolation software inside them in order to output such nice big prints. It is with good interpolation programs and techniques where one photographer or production house will beat out another one on final output. Many Sports Shooter members have already heard about fellow Sports Shooter member, Pulitzer Prize winner and The New York Times staff photographer, Vincent Laforet's www.vincentlaforet.com gallery show " PERSPECTIVES" that is opened in New York on March 16th. Vincent upsized and interpolated all of the pictures for this impressive gallery show before his final output, and from what I heard these prints looked fantastic. I look forward to Vincent's next "Digital Darkroom" story to get the entire lowdown on just how he completed these tasks. Learning proper interpolation methods and techniques, getting comfortable with all this stuff will not happen overnight, that is for sure. It did not happen overnight for me or any other person who now knows what can be done with interpolating. Here is an alphabetical breakdown with web links and prices of the current software and methods that you can be obtained to interpolate your digital images. Watch for the many short-term limited use and trial offers the different program developers have online. 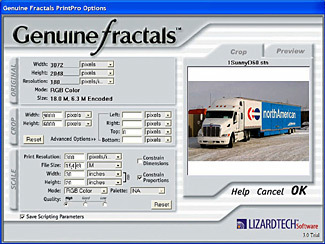 LizardTech's Genuine Fractals Print Pro 3.0 interface running inside Photoshop 7 and on Windows XP. * Independent developers. Prices vary. * Stair Interpolation Pro (SI Pro) is a Photoshop plug-in. $19.90US www.fredmiranda.com/shopping/affiliate.php?id=13"
Fred Miranda has turned a hobby into a flourishing cottage industry by developing and selling 100's of Photoshop actions as well as his more developed and structured Photoshop plug-ins. While they both take advantage of Photoshop's® bicubic interpolation, unlike the free Photoshop action offered above by interpolateTHIS.com, Fred Miranda's Stair Interpolation Pro (SI Pro) is a developed, fully functional easy-to-use program which has its own interface with controls and options; including sharpening, custom controls to set page sizes for later printer output. Fred Miranda's Stair Interpolation Pro (SI Pro) has thousands of happy customers and these digital photographers leave very positive comments worldwide on web bulletin boards about its interpolating abilities. I am one of them. This is an inexpensive way to enter the interpolation world; it is low cost and it does work. There is NO free download or trial version of Fred Miranda's Stair Interpolation Pro (SI Pro); you will have to buy it to try it. www.fredmiranda.com/shopping/affiliate.php?id=13"
Adobe's Photoshop 7 running on Windows XP. Showing "General" controls box where Bicubic set-up can be found and set, inside "Preferences" under the "Edit" menu. Photoshop has a number of interpolating choices and options that can be found in the "Preferences" of the program itself. The choices are: Nearest Neighbor, Bilinear and Bicubic. The best one to use in Photoshop is in fact Bicubic. You should really take a quick double check to make sure that your version of Photoshop is actually set to use Bicubic when it up-sizes or interpolates an image. The reason for this is simple; the Nearest Neighbor interpolation technique does just what it says. It takes the nearest pixel and it clones it as it up-sizes the image, this of course can lead to a decrease in quality very quickly as well as moiré in certain sections of the photograph depending on the image content. To check and or to change the interpolating method of your choice all you have to do is go into the "Edit" menu, open ""Preferences" and then open "General" and the interpolation box is right there. Please check above for the link that will get you a free 110% interpolation Photoshop action. * PhotoZoom $49US and PhotoZoom Pro $129US PC or Mac. (Just renamed and improved from S-Spline 2 and S-Spline Pro). 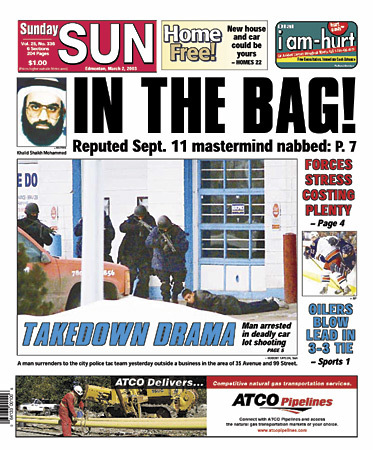 This is a copy of the front-page of the Edmonton Sun for March 15, 2003. The original file before interpolation was a really bad 140k police mugshot that we had on file. *Of special and interesting note Celartem www.celartem.com a large Japan based technology company in fact owns both Extensis www.extensis.com the makers of pxl SmartScale and Lizardtech www.lizardtech.com the makers of Genuine Fractals. These two completely different programs are in competition with each other, and they are owned by the same company. 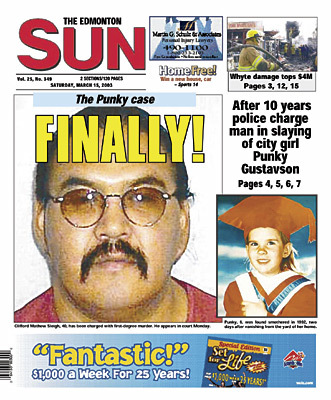 This is a copy of the front-page of the Edmonton Sun for March 2, 2003. The original file was a 1.2 meg file that we needed to be just around 9 meg. This was our first ever S-Splined front-page. I would like to thank Robert Hanashiro and the rest of the SportsShooter.com crew for all the support while making this article. And to my wife Birgit, children Stephanie and Nicholas for putting up with my not being around much while I continue to work on this subject, other professional as well as the other community projects that I work on.